Hi everyone, after much lurking I have finally decided to make an account. I'm Corvus, I'm a Staff Sergeant in the US Air Force, and I'm building my first crossbow in a cave with a box of scraps in my woefully inadequate, largely improvised workshop. I'm hoping to get some advice/critiques from some of the more experienced members here. For my build I'm using a 120lb steel bowstave from Slobows, which in hindsight may have been biting off more than I can chew. The stock is made from a piece of fir I picked up from Lowes. 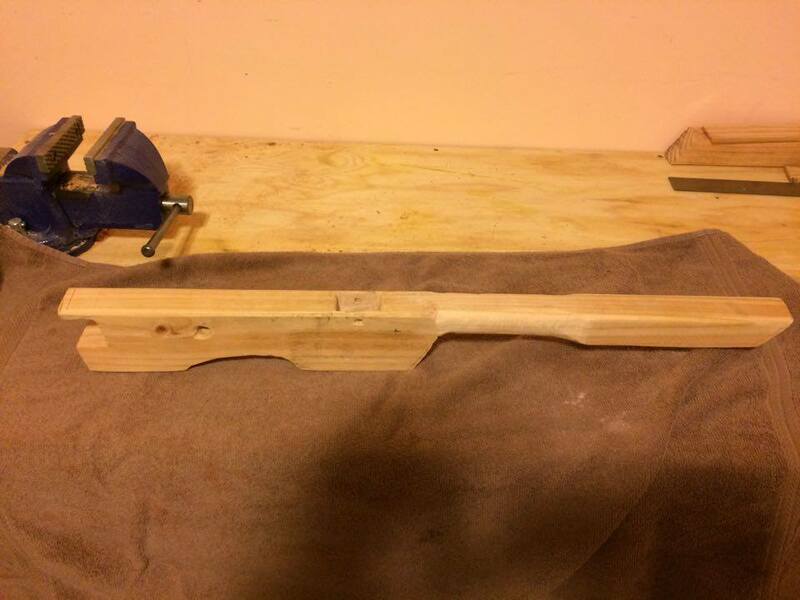 The overall design of the stock is pretty basic as I have only rudimentary woodworking experience and am using mostly hand tools. The trigger mechanism is a roller nut, which I also acquired from Slobows. I have zero experience with metalworking/forging, and lack the tools and facilities to start, so I've contracted my good friend to forge a stirrup, trigger bar, and lockplates for me. The stirrup will be bolted to the stock, as I figure binding the bowstave to the stock will be easier if there's fewer other parts involved. Here's a photo of what I have so far. I know the workmanship is rough and downright crude in places. This is honestly the first project I've done that involves actually shaping the wood, so mostly it's been me and my good friend Mister Chisel just doing our thing and hoping for the best. I'm hoping it'll look nicer after some good sanding and filing. The narrow bit of the stock near the end is where I'm attempting to work it down to a thinner, somewhat cylindrical shape, which I'll wrap in 550 cord as a grip. What material is best for binding? I have some 550 cord, though I figure that's probably too thick and elastic, and some twisted mason line. What tools are best for getting those nice curves in the stock design? What type of woods should one avoid for making stocks? I didn't quite measure it out, but yeah, I tested this prod and the draw on it is not terribly far from what I can tell. Plus I'm trying to err on the side of caution for my first ever bow. Attempted to bind the prod this evening, and as I suspected it's been nonstop frustration. I'm going to need to re-design the binding block and enlarge the bridle hole, and then hope I can get it from there. Next time I'm doing bow irons this is annoying as hell. Hey guys; just don't let your wife see you tring to learn to crochet. 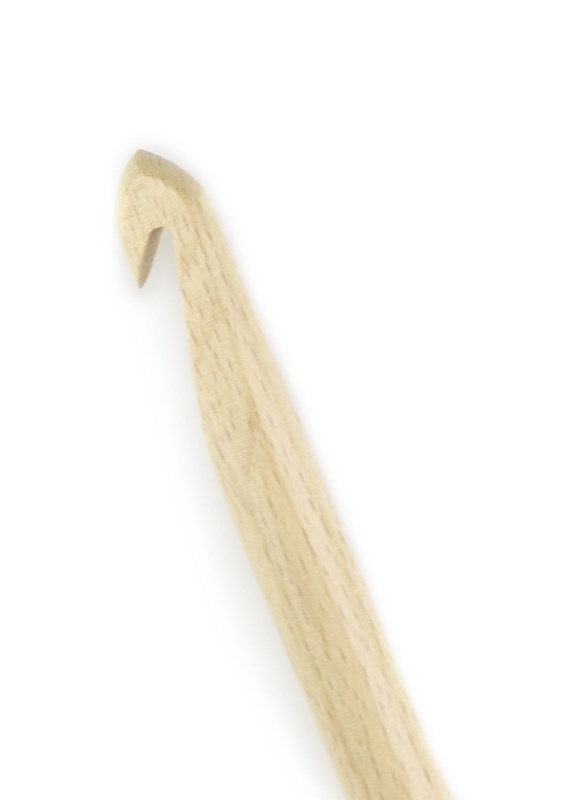 The craft stores all have these hooks and they work good.I see some of the guys use hemp to bind things tight. I'm of the thought that binder twine might even work. Geezer would know about that, maybe we'll catch him off guard and he'll chime in.I don't think it is so much what type of string , it's more how your pull and cross it. These things are a work of art and can be as though they were welded steel. I'm using hemp cord. Nice and strong but on the thick side. I'm gonna have to take some time to widen the current hole and that should help a lot. Making a better binding block will be easy. Question, do you guys like to bind the stirrup and binding block together with the same bridle, or do you prefer to use a secondary bridle to secure the stirrup? Geezer here, on binding in the prod (Payne Gallway calls it the bridle) I use a fairly large, 3/4 in ch diameter hole for the binding, then flatten out the front and chamfer the edges... that's the way German medieval bows did it. Spanish bows seem to have used a round hole, but I find the flat fronted D shaped hole lets me get the bridle-cord more even laid down for a neater appearance and tighter packed bundle of cord. That means it stays tight longer. Somewhere up the way, I listed the online address for the guy in Germany who shows how to bind-in the ancient way. I pretty much use that now, and the hemp cord is all one piece. I use 7 fathoms of 170 lb. heavy hemp twine to bind in first the prod and then add on the stirrup. It's all one piece of cord. In the old days, I used to bind with hand-wound flax cord (made with a macrame winder from Barbour's shoe-makers twine) For that I used two pieces... a longer section of about 4 fathoms for the prod, then I tied in the stirrup with a second piece (2 fathoms) for the stirrup and then cinched up the sides of both skeins together. The idea was if the stirrup worked loose, perhaps the prod-binding would stay tight. Maybe it helped, maybe it didn't. As I got better at getting the binding tighter and laid down in a more compact mass, my bows stayed tighter anyway. Medieval bows usually fixed the binding with a sort of glue/wax blend. I've tried that with hide-glue... it got sticky when wet and didn't seem to make things stronger, but such bows were lots more trouble to work on if they needed to be re-bound, so I don't do that any more. As for cord of choice: medievals seem to use hemp, every time. It was readily available. In fact any reasonable cord should do the job if you use enough of it. A big wad of cord is certainly correct for medieval style bows. Binding blocks: I use a lot of prods that are about 1 and 3/4 inch wide, so my blocks are the same. For narrower bows, I make sure the socket fits the narrower prod and cut down the center of the block, but I usually leave the sides of the block wide to accomodate the cord. I think wider blocks get your bridle tighter once you start cinching up the sides. Any other questions? Geezer. Attempted to do the binding today. I was able to successfully bind the whole thing together, but try as I might I can't keep the cord tight enough. It's just loose enough that the bow/block/stirrup assembly wobbles and with a good tap the whole thing can slide apart laterally. I just don't have enough hands to bind it while simultaneously holding the whole assembly together and keeping the cord locked tight. I'm going to need at the very least some very large vices and some proper tools for threading the cord, and I don't have the space or the money for something like that right now, especially with the news that I'm going to be packing up and moving to Alaska this summer. I tried getting bow irons that were supposed to fit the prod and stirrup I bought but they're not big enough so none of it fits. To be honest, I think this is it for me with the whole crossbow thing, at least for now. I've sunk hours and hours into this and hundreds of dollars in tools and materials and the best I can get is barely-functional garbage that isn't going to be able to withstand the strain of cocking and shooting. It's just too much frustration to be worth it. Maybe one day when I have a proper workshop and more than basic hand tools, I'll give it another swing, but for now, I'm putting it aside to work on something else that isn't going to have my tearing my hair out in frustration. Oh, and to be clear, I'm not quitting bow making altogether, just going to try something a bit easier and less expensive before I go back to trying to make the steel bow work. I'll probably try to go with something like this that won't cost me a bunch of money.